I’ll be honest, I was quite skeptical about booking a holiday to Mallorca. 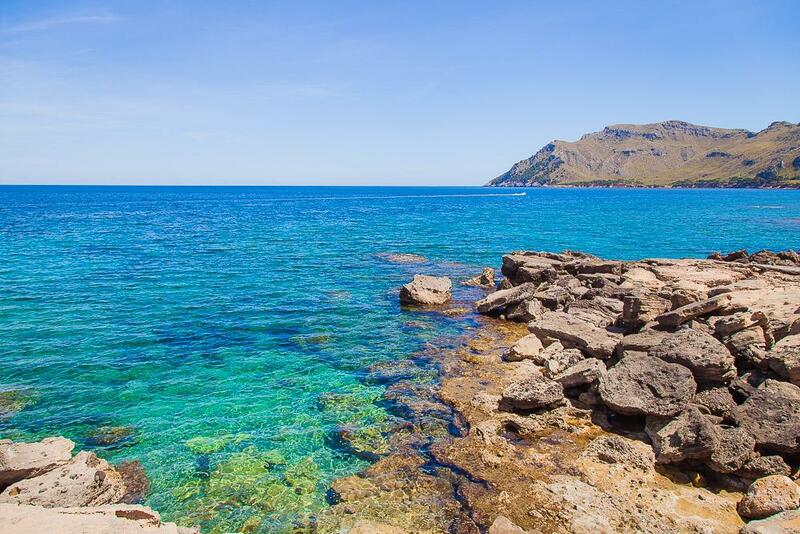 In fact, the only reason I agreed to visit Mallorca was that Dan really wanted to a beach holiday but was only able to get time off in May, and most of the other inexpensive beach destinations in Europe would have still been too cold for swimming. Plus Dan’s mom’s boyfriend used to live on Mallorca and promised us that there’s more to the island than big resorts. I had only ever heard of Mallorca as a resort destination, and while maybe someday a resort holiday will appeal to me, right now it really doesn’t. I mean, if I was going to go to Spain, I wanted to feel like I was in Spain, you know? But it turned out Tim was right about his old home, and by the end of my two weeks on the island, I realized that I might just be turning into one of those Norwegians who wants to holiday in Mallorca every year. What? 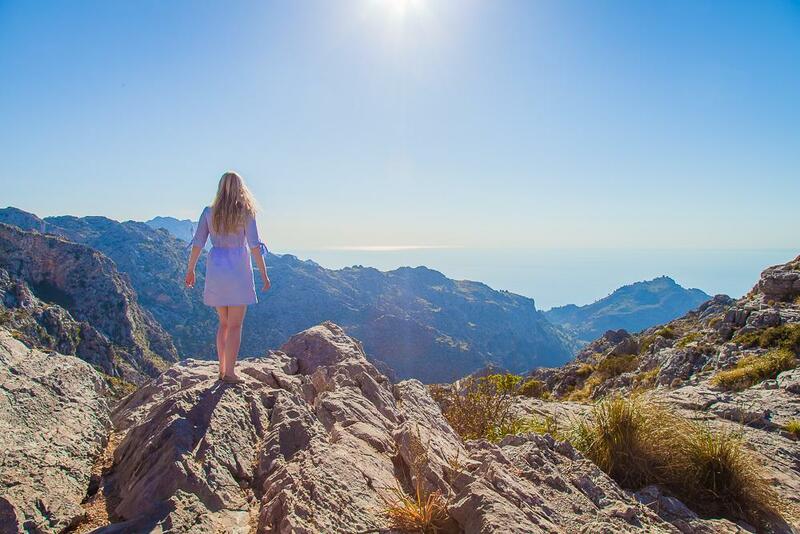 I hadn’t actually even planned to blog about my trip to Mallorca as it’s such a popular destination I assumed I wouldn’t have anything new to add to the Internet about it, but Mallorca surprised me so much that I thought maybe it could surprise some of you too. 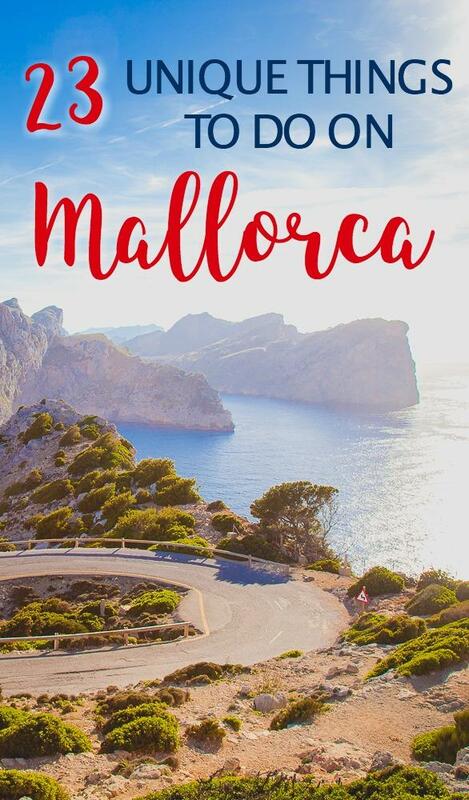 It’s pretty easy to visit Mallorca without renting a car, as you can get buses around the island and a lot of the big hotels will arrange a shuttle for you from the airport, but by having our own car on the island Dan and I were able to see so much in our two weeks there. We rented from rentalcars.com, which were the cheapest option when I looked – you can check their rates for Mallorca here. I think we spent about half our time on the island just driving around – not really intentionally, but every time we got in the car to go somewhere we ended up driving off route to explore narrow roads and small villages. Car rental on Mallorca is quite cheap, but if it’s out of your budget or you don’t drive, we also picked up a few hitchhikers who told us that hitchhiking around Mallorca is incredibly easy. As in, you probably won’t have to wait longer than five minutes for a ride. 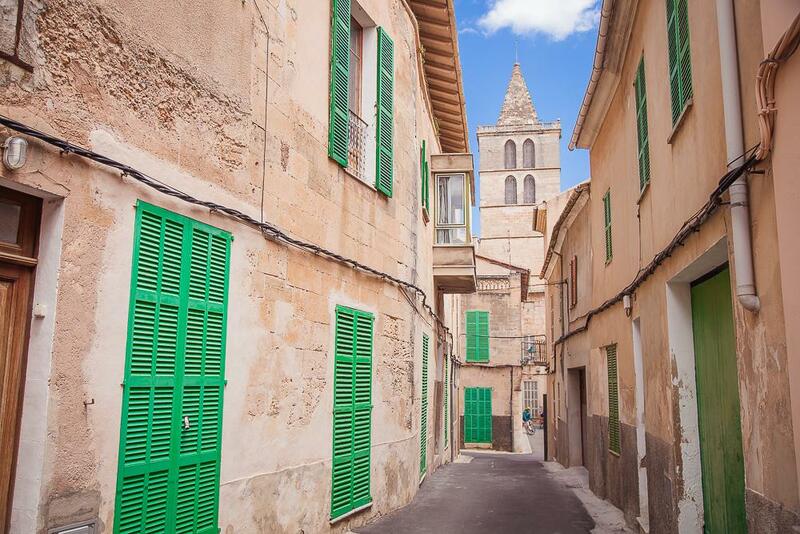 Our first stop on the island was Mallorca’s capital city: Palma. We only spent a couple of nights here, but I secretly wished that we had stayed here longer. I think I just love Spanish cities, and I really enjoyed getting to experience a bit of Spanish city life while on a beach holiday. At the end of our two weeks in Mallorca, Dan asked me where on the island I would most like to live and Palma was an easy answer. I loved that, aside from the very center, there weren’t many tourists here (people generally aren’t visiting Mallorca for the cities), and walking through the neighborhoods made me seriously consider replacing my Norwegian language books with Spanish ones. 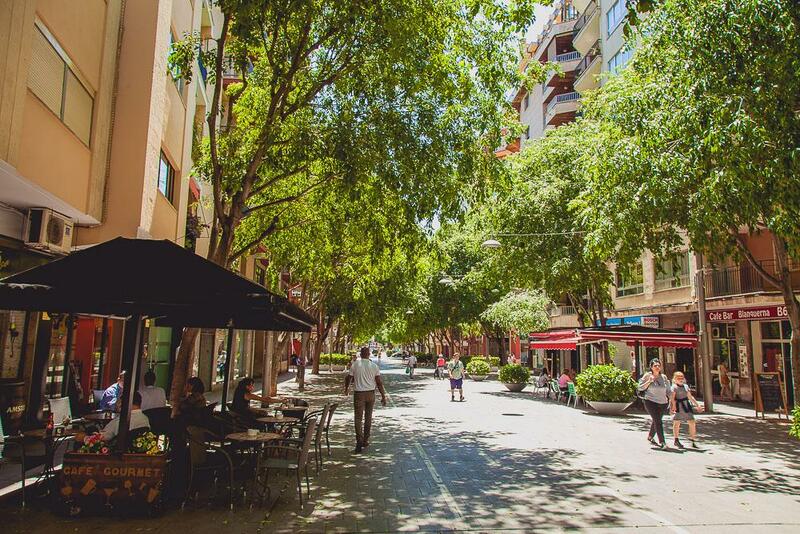 If you do spend a few days in Palma, check out the many options on Airbnb. You’ll find places like this container home a 15-minute walk from the historic center, this apartment with sea views and only a short walk from Cala Mayor Beach, or this apartment right in the center of Plaza Mayor. And if this is your first time using Airbnb you can get a discount by [signing up here]. Also, for those that do want to see a little more of Palma, check out the many different tours around and near the city. Santa Catalina was my favorite neighborhood in Palma. This is where the fishermen used to live, and while the area is probably most popular for its huge indoor market, Mercat de Santa Catalina, Palma’s oldest food market, I just loved wandering through the pretty streets and imagining what it would be like living in one of those apartments. Definitely check out the Airbnbs in this neighborhood if you want to stay in Palma. There are lots of lovely restaurants here too – I probably would have come here for dinner every night if I had been in Palma longer. While Palma was the place on Mallorca I’d most like to live, my favorite place to come on vacation was definitely Cala Figuera. This was the second place we stayed on Mallorca and just a few days after leaving I was already feeling nostalgic for my time there. Cala Figuera is a working fishing port and doesn’t have a beach, so it really felt tucked away from the tourist side of the island. I can imagine the village feeling different during the high season, but it was so quiet when we were there in mid-May. And now, maybe not everyone would consider this a positive thing, but the town was a bit rundown with several abandoned buildings that reminded me a lot of the Albanian coast. And comparing any place to the Balkans is basically the highest praise I have. We spent three nights in Cala Figuera and I could have happily stayed much longer. We stayed at Hostal Can Jordi, which had the best view out of all the places we stayed on Mallorca. I loved looking out onto the water from our balcony and being woken up early in the morning by the fishing boats coming in with their catch. If you’re looking to stay somewhere a bit more upscale, Hotel Villa Sirena also looked really nice. It’s right on the water (ask for a room with a sea view!) and has a restaurant and pool. 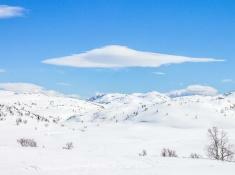 Check current rates and availability here. Of course, there are also plenty of Airbnb options. Just check out this fisherman’s cottage, this old stone house with panoramic views, or this apartment with its idyllic terrace. There are several restaurants along the water that were quite lively at night, but my favorite restaurant was a few streets back from the water in an old church. La Petite Iglesia is run by the sweetest french couple and the food there was so, so good. Dan still talks about the ribs he ate there. We actually went there for drinks one night but didn’t stay because we were the only guests and I feel uncomfortable enough in restaurants without the added attention of being the only people there (seriously, restaurants make me feel so nervous!) but the owners were so laid back that we decided to return the next night. And oh my goodness, that was such a good decision! Why just admire the sea from land when you can get out on it? 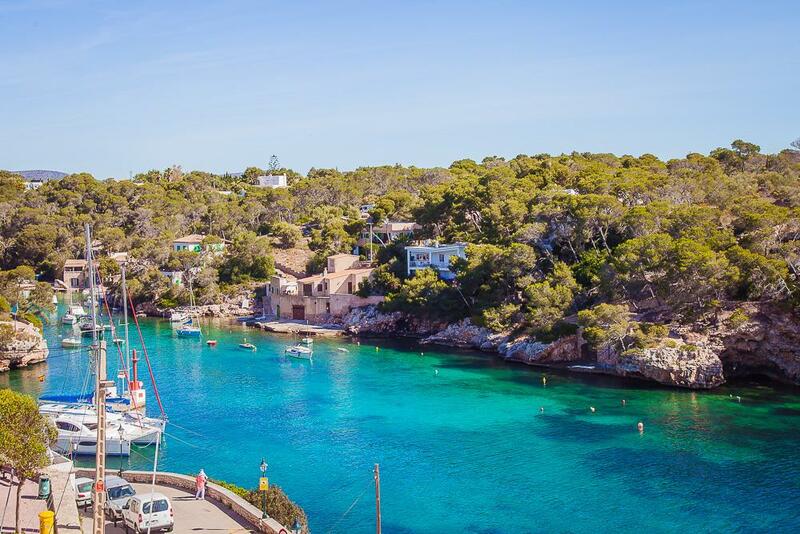 Mallorca offers tons of different boat cruises leaving from different parts of the island, like this sunset catamaran cruise, this yacht cruise, and this super affordable boat trip. Or you could go jet skiing! You don’t need any previous experience with this jet ski trip. 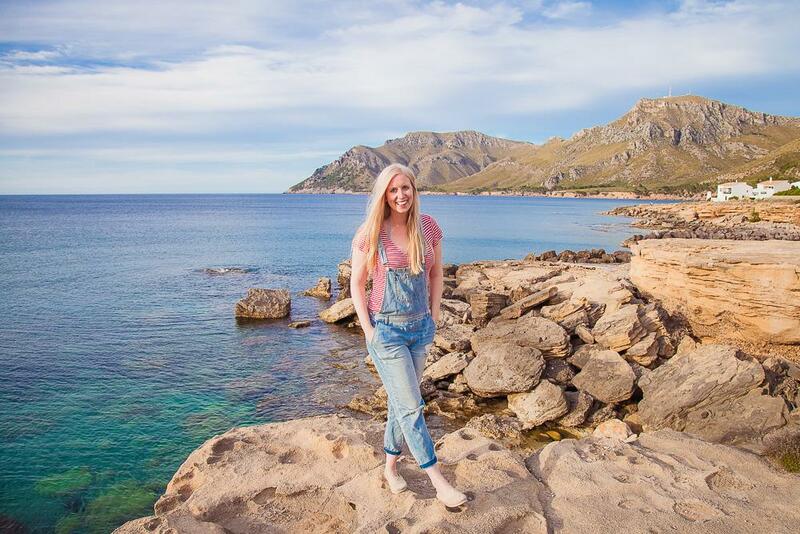 I had so many favorite beaches on Mallorca that I’ve written an entire blog post detailing my favorites, but I’m going to mention the beaches in Mondrago Natural Park here as well because they were my favorite favorites. Like, on our last day on Mallorca, Dan and I drove from the opposite end of the island to this beach just because we loved it so much. The beach is beautiful, and it also just had a really great vibe. It was busy, but mostly with Spanish people (again, this might be different during the high season), it has a little shack selling drinks and sandwiches, and since it’s in a park there are no hotels or resorts by it. 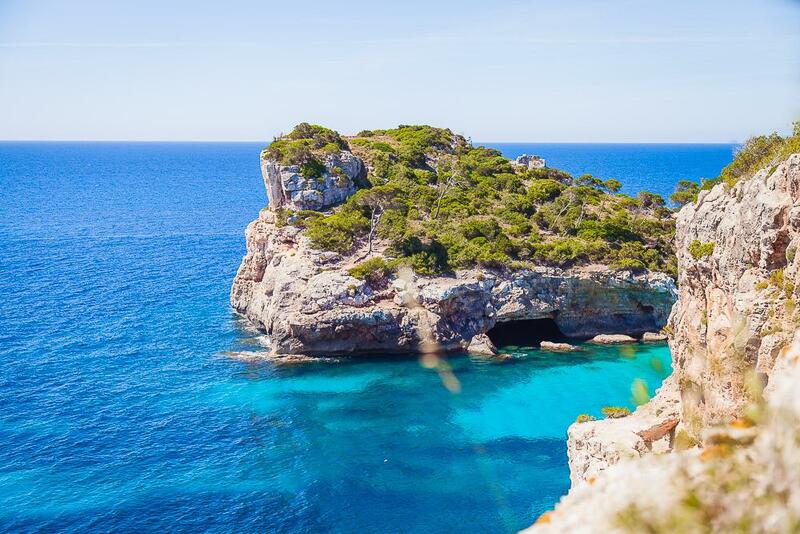 I wrote more about Calo des Moro, the prettiest beach I visited on Mallorca, in my post on the beaches, but I also wanted to mention in here because the hike down to the beach was so beautiful. If you visit this beach, definitely work in some time to hike around the surrounding cliffs as well! So, I actually didn’t make it here, but the women running our hotel in Cala Figuera told us we really should see Es Pontàs, which is a big natural arch in the water that looks kind of like the Azure Window that recently collapsed on Malta. It’s right by Cala Figuera, so probably worth visiting if you’re in the area. 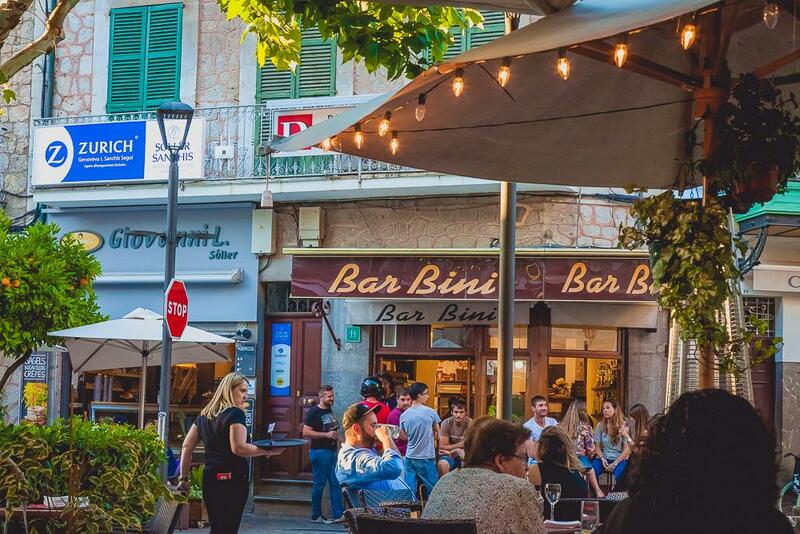 Mallorca really does seem to have two completely different sides to it – the resort towns that are full of huge hotels, English pubs, and souvenir shops, and the lovely little Spanish towns and villages where you’ll struggle a bit if you don’t speak any Spanish (hello, that’s me). While staying in Cala Figuera, Dan and I accidentally drove through Colonia Sant Jordi, a big resort town, and it was so grim. Or at least, it was so not somewhere I wanted to be. But then we drove through Santanyi and immediately fell back in love with Mallorca. Santanyi has a lovely square with little restaurants and cafes and is the perfect place for a quiet stop for lunch or coffee. If you want a truly memorable experience of Mallorca, why consider taking a hot balloon ride through Mallorca. The ride lasts two hours and you can do it either at sunrise or sunset. Our next stop in Mallorca was Colonia de Sant Pere, which was the most “holiday-y” place we stayed on the island – our hotel even had a pool! Dan’s mom had recommended this town to us, as it has lovely views and a good beach holiday feel without being crowded or bland. I’m actually surprised this town isn’t more popular – the mountain backdrop made the beach all the more lovely, and there were lots of seaside restaurants to choose from at night. I loved the hotel we stayed at here, Hotel Solimar. It has a beautiful garden and pool and the woman running it was really, really nice. She only speaks Spanish and German (maybe a little English too) so we communicated in German, and she was very eager to help us enjoy our time in Mallorca. 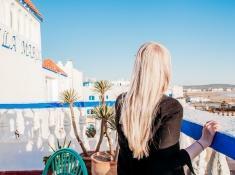 Airbnb also has a lot of great options in Colonia de Sant Pere, like this beautiful home close to the sea, this Mallorcan style home, or this Asian-styled apartment with a shared pool. Colonia de Sant Pere has a lot of quite fancy restaurants that while not too expensive still felt a little too upscale for my tastes (did I already mention that restaurants make me nervous?). Dan’s mom had recommended that we go to a “caf” (Brits, what is caf short for? Café? Cafeteria?) on the seafront which we didn’t manage to find (it was actually in the yacht house) but we did eat dinner at a lovely local restaurant right across from the port, Restaurant Es Mollet. No one spoke English there and Dan’s Spanish is limited (as opposed to my Spanish which is just French with a Spanish accent) so they ended up just choosing dishes for us and they were so good. But aside from the food, I really just loved people watching here, as it seemed to be a bit of a hang out for locals. Everyone seemed to know each other and kept switching tables – eating here sort of felt like being at a wedding. I think just about all of the tourists I saw on Mallorca were German. I don’t know if we just happened to hang out in the German areas or if all the Germans in the world were holidaying on Mallorca while we were there, but it was pretty crazy! 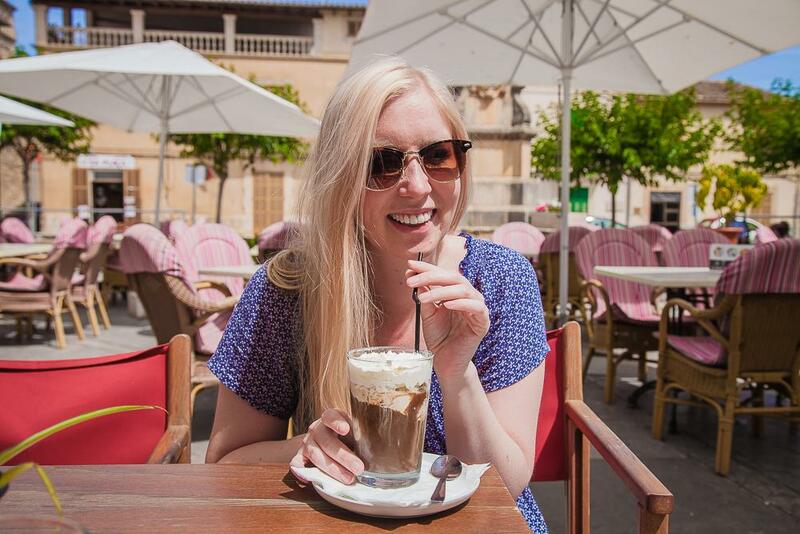 But one of the things I loved about there being so many German tourists around was that a lot of the cafés serve “ice coffee,” which in most of the world means coffee served over ice, but in Germany means coffee served with a couple of scoops of vanilla ice cream in it. At least, I think this was because of the Germans – or is it a Spanish thing too? Regardless, I loved it. I’m not the biggest coffee connoisseur (I like my cup about half coffee, half milk) so adding ice cream to it makes me really happy. So yum. I had this a few times, but the best was in Petra, probably because it’s just a totally random village in the middle of the island whose lack of anything special made it really special. If you’re up for an adventure, take a quad biking trip around the island. At the end you can even go cliff diving! One of my favorite drives on Mallorca was the drive up to the Cap de Pera Lighthouse, even though all the twists and turns made me really carsick. The views were well worth the nausea! (At least, I decided they were once the nausea subsided.) 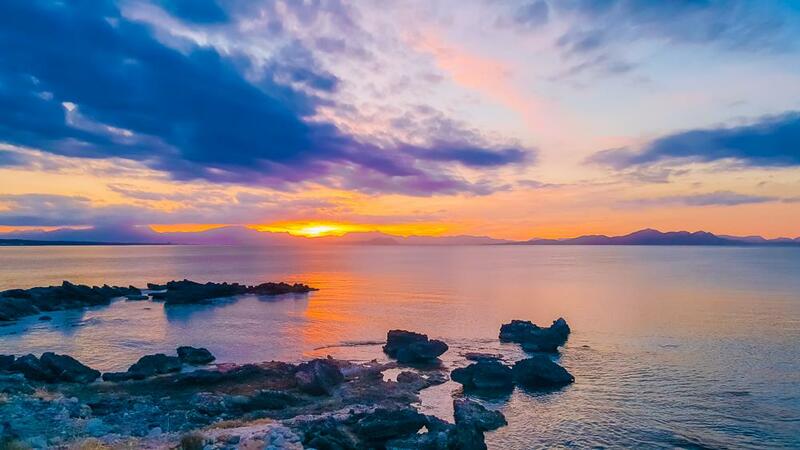 There are a lot of hikes near here, as well as small beaches, and it’s a popular place to watch the sunset. 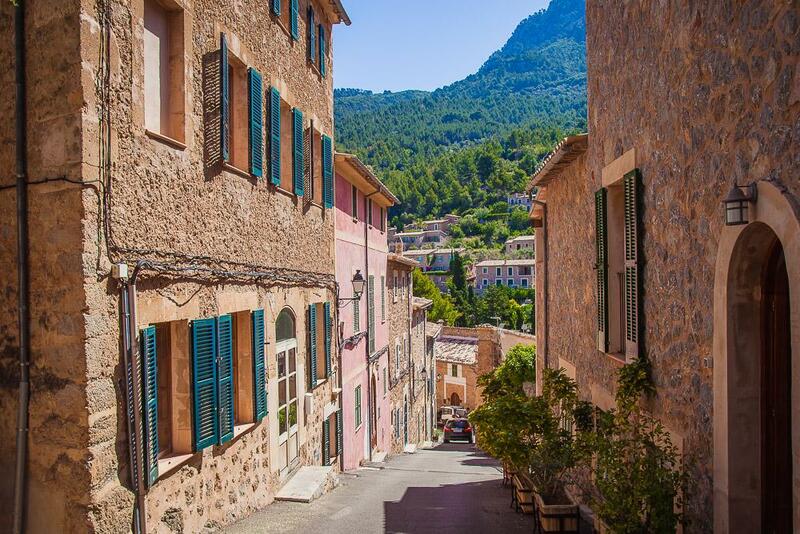 I loved all the tiny villages on Mallorca, with their steep hills, narrow streets, and quiet squares. One of my favorites was Montuiri, I think just because there was nothing to do here besides admire the pretty views. Arta was a little fancy for my taste – it has a lot of boutique shops catering to tourists – but I really loved its town square. Dan and I stopped here after a day at the beach and I loved cooling down while watching all the local kids playing in the square. Maybe I was a bit jealous of them and their rollerblades. We spent our last four nights at the loveliest Airbnb in Sóller, a town near Mallorca’s west coast. Sóller is up in the mountains and we had actually intended this to be the mountain portion of our trip, with lots of hiking, but I guess Dan and I have become more Norwegian than we realized – all we wanted to do was lie in the sun on the beach! It’s so weird – I don’t really tan and have always gotten bored quickly when lying on the beach, but this holiday in the sun felt so good. I guess I really am deprived of it here in Norway! So while Dan did manage to wake up for a sunrise hike in the surrounding mountains, I didn’t go on any hikes at all, and while staying here we just kept driving across the island to sandy beaches. Whoops. I’m still really glad we spent some time in Sóller though because the mountains really are beautiful, and the town center is lovely. Sóller probably has the prettiest town square I saw on Mallorca, complete with an old wooden tram that runs through the town and down to the port. 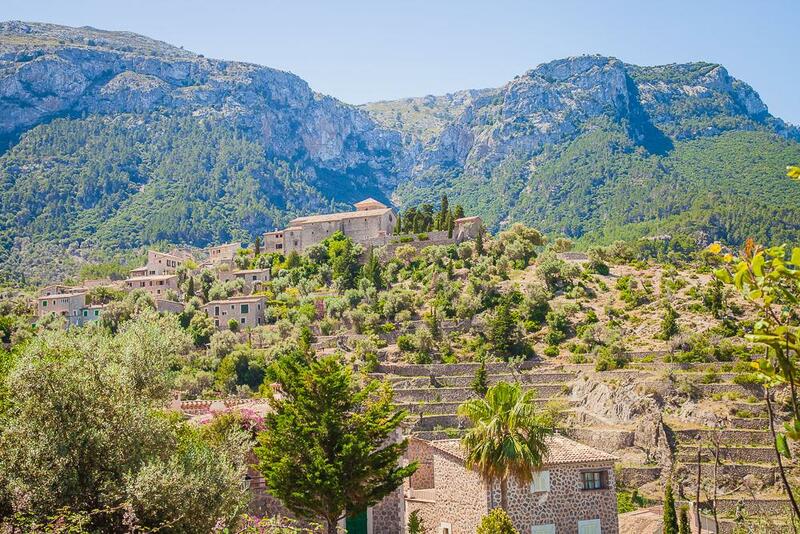 We also drove down to check out Port de Sóller, but I really didn’t like it – it just seemed like it was full of fancy holiday homes. 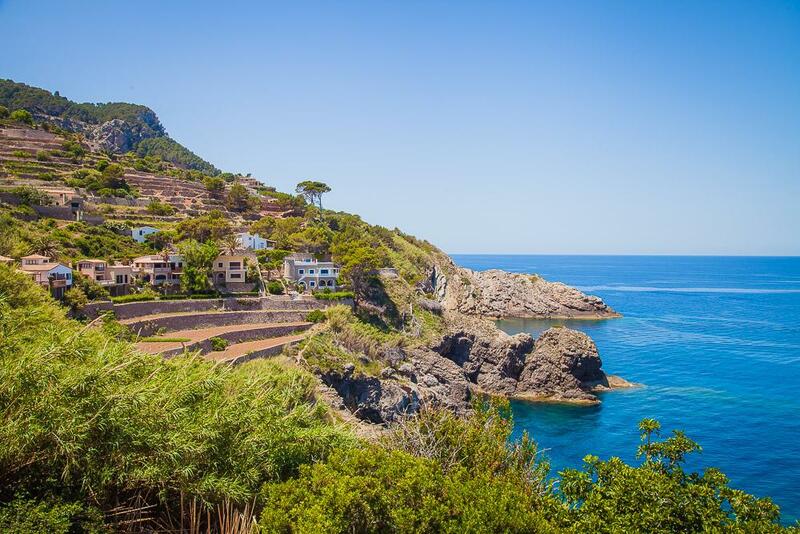 So I’d definitely recommend staying in Sóller over Port de Sóller if you have the option. Oh my goodness guys, this road. 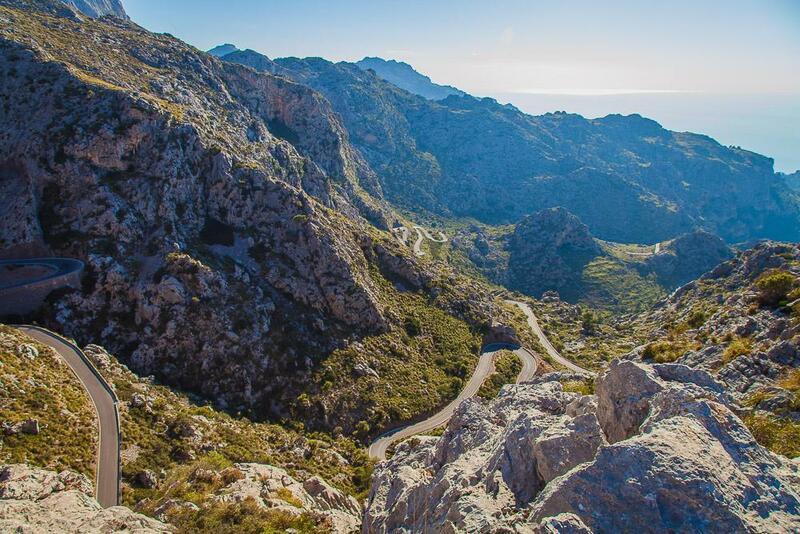 Dan and I drove down to Sa Calobra for the beach, but the road down there was the true highlight. I don’t know how many hairpin turns it has, but it’s like Trollstigen on steroids. 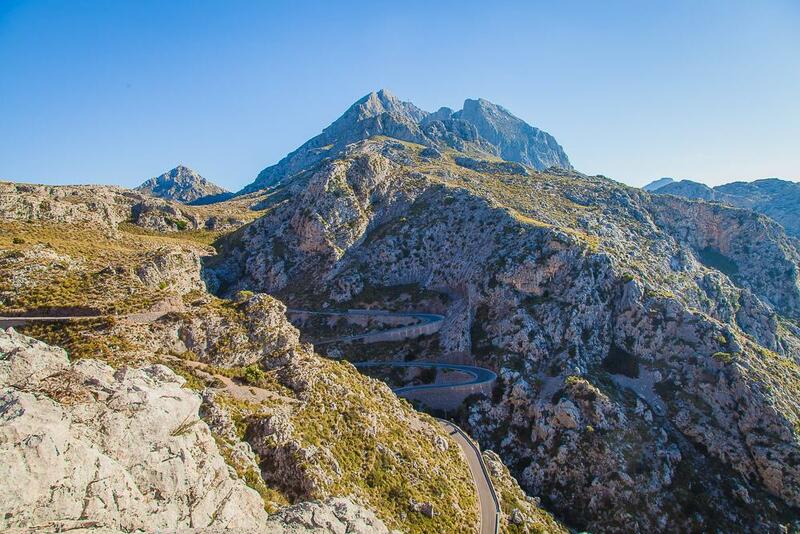 Like, Norway is pretty famous for its hairpinned roads but I’ve never seen anything like the road to Sa Calobra here. It was really hard to capture in photos (partly because I was too scared to get close to the edge) so you will just have to go to Mallorca and drive this road for yourself. And if the views from the drive aren’t amazing enough for you, the beach at the bottom is incredible. So many reasons to go there. So go! 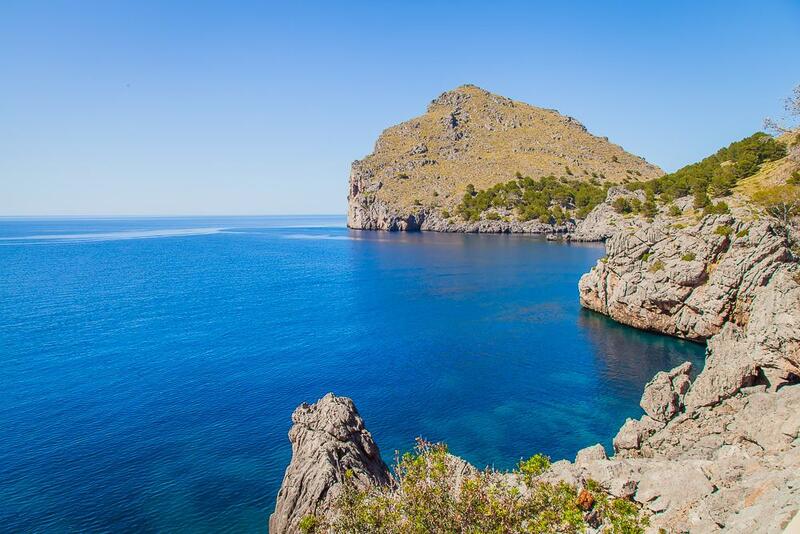 Drive from Sóller along the west coast – but stop before you hit Magaluf! So like I said earlier, I spent a lot of my two weeks on Mallorca driving around. Dan was a bit grumpy about it, because Mallorca is a dream cycling destination but he couldn’t cycle because his leg was injured (and because carrying me on his handlebars would have made for some very slow uphill journeys – and dangerously fast downhill ones!). But really, the roads on Mallorca are just so stunning. Our flight out of Palma was in the evening, so we spent our last day driving from Sóller down the west coast, and wow was it beautiful. The beaches here are mostly rocky so a lot of the coastline was pretty deserted – at least until we started to get a little too close to Magaluf, England’s favorite resort destination. We didn’t actually drive through Magaluf, but considering the dramatic changes as we approached it I’m going to say that avoiding it was a good call. If you want a really cool adventure, you can go on this sea caving excursion. 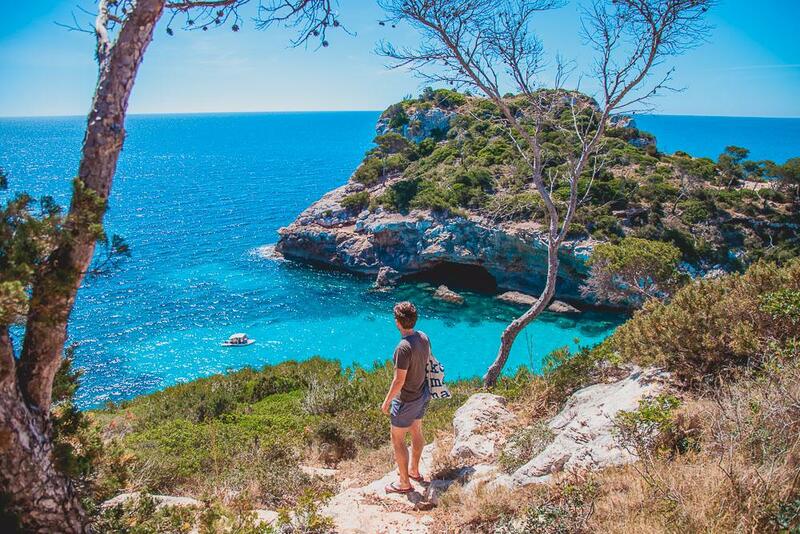 During the 5 hour excursion you’ll explore Mallorca’s most beautiful caves and get to see a totally different side to the island. I’m way too scared to climb cliffs, and certainly to dive off of them, but if you’re braver than me this coasteering excursion looks so fun! Lol okay, you don’t really need to do this while on Mallorca. But you know how I said Dan had injured his leg and couldn’t cycle? He had a large graze that had become infected and so we had to make two trips to the public health clinic in Pollença, and I was so impressed! I think our total wait time was under 2 minutes each visit, and he left with an armful of creams, bandages, and a prescription for antibiotics. He only had to pay for the prescription, which cost 2 euros. 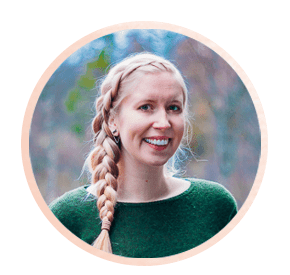 The whole experience made me 1. super grateful for my European health card (thank you, Norway) and 2. even more exasperated with the US health system. Like, why?? Also, Pollença is really beautiful and we had a lovely lunch in the town square, so maybe consider visiting even if you don’t need to see a doctor. 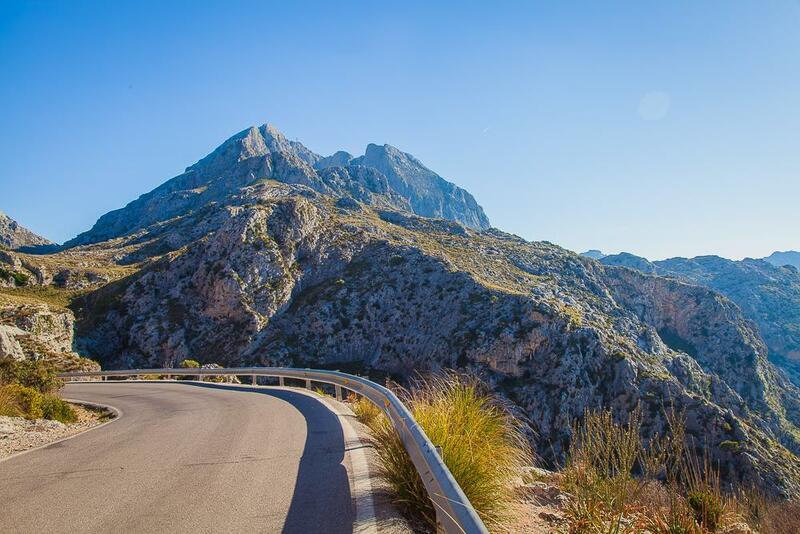 And the mountain road from Pollença to Sóller is spectacular! Deia is so lovely. Deia might actually be too lovely. This is where Dan’s mom’s boyfriend used to live, and it also happens to be a favorite haunt of a bunch of rich and famous artist types, largely thanks to Robert Graves making it his home in the 1930s. So like, it’s pretty hip. 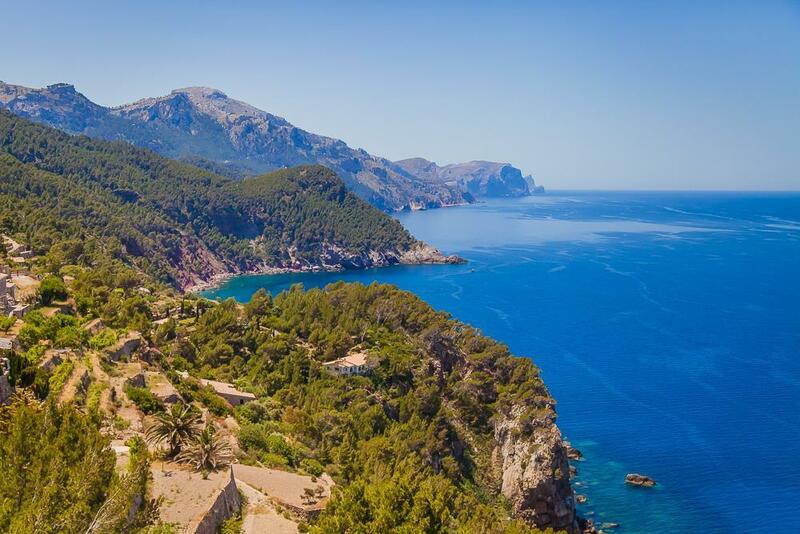 It’s funny, because when I read about Deia it was described as the perfect escape from the resort side of Mallorca. Deia is part of “the other Mallorca,” Google told me. And I definitely did get the feeling that there are two totally different Mallorcas – at least until I got to Deia, when I decided that there might actually be three Mallorcas. 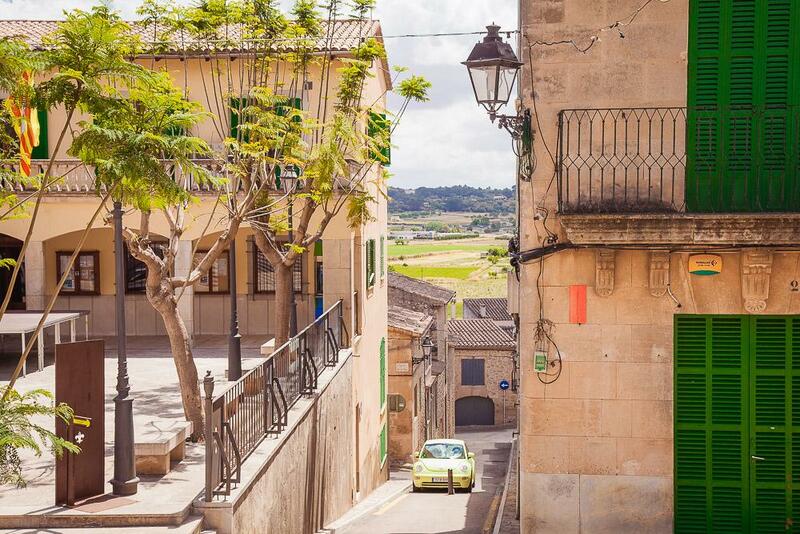 There’s the tourist resort side, and then there are the quiet Spanish towns and villages. 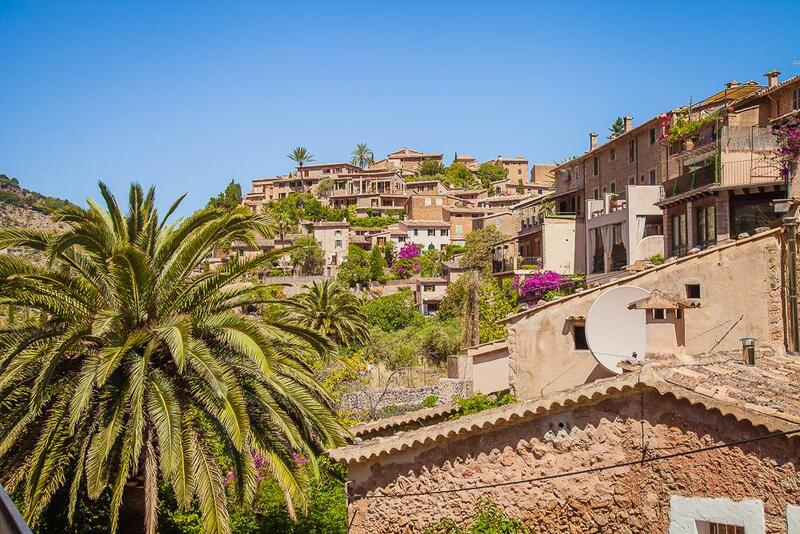 But then there are also places like Deia, away from the tour bus routes, but also filled with foreigners. A lot of the villages we drove through along the west coast were like this – beautiful, with no signs of chain hotels, but also very fancy. 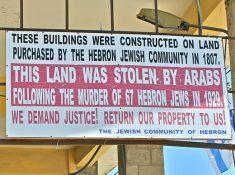 What I’m saying is, I wasn’t too surprised to hear that some of these villages were favorite hideaways of millionaires. Banyalbufar is another town popular with foreign artists. It’s worth stopping here to see the terraces going into the water. Apparently the Moors built these terraces for their vineyards, but now they’re mostly just growing vegetables. There’s also a beach at the bottom of them that seriously tempted me to get covered in saltwater before my flight to London. The tower itself isn’t so spectacular, but the views from Torre del Verger sure were! 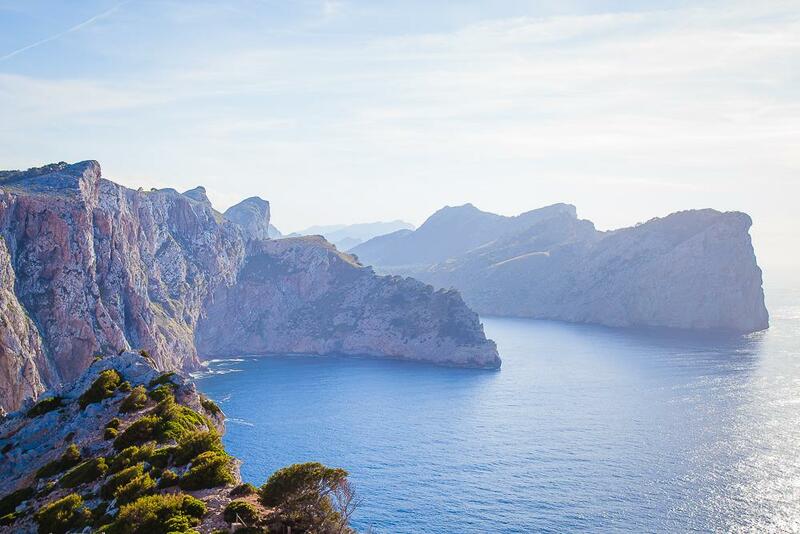 Have you been to Mallorca? Do you have anything to add? I was in Mallorca last December and did some of the suggestions in this article. 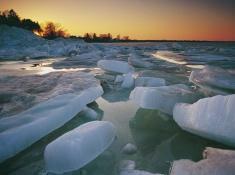 Wonderful advices.. and a great article. Well worth renting a car to get around the island, however, opt for the smallest vehicle you can manage with – parking can be a nightmare in the height of summer!